Is it time for Sheryl Sandberg to, dare we say, lean out of leading Facebook? The Facebook COO is under fire after an investigation last week cast a harsh light on Sandberg's and CEO Mark Zuckerberg's mishandling of the growing threat of fake news, election interference and other security issues on Facebook. Now, a chorus of critics who say that Facebook needs a serious management shake-up seems to be growing louder. In October, a group of major shareholders, including Trillium Asset Management and several state treasurers, co-signed a proposal to oust Zuckerberg as chair of Facebook's board. In a recent note, Stifel's Scott Devitt wrote that a change Facebook's upper ranks might be the quickest path to restore the company's credibility: "In our view, Facebook's board and management team could accelerate the credibility rebuild by considering making change(s) at the top of the organization," he wrote. But with Zuckerberg controlling 60% of voting shares, investors aren't necessarily holding their breath for the Facebook chief to relinquish one or both of his roles. That leaves the hammer to drop on Sandberg, according to Jeffrey Sonnenfeld, associate dean at the Yale School of Management. "Sheryl Sandberg should be out of there by sunset -- she is as divisive and demoralizing as any leader in tech today," he said. In an interview on Tuesday with CNN Business, however, Zuckerberg expressed support for Sandberg and said he hopes to continue working with her "for decades more to come." One of the thornier details that emerged from the New York Times' investigation published last week was that Facebook hired a DC-based opposition research firm called Definers Public Affairs to spread inflammatory messages about Facebook's critics -- including lawmakers -- as well as rival technology firms. That didn't sit well with a group of U.S. senators, who wrote in a joint letter that the report "raises concern that the company could improperly or illegally use its vast financial and data resources against government officials and critics seeking to protect the public and our democracy." 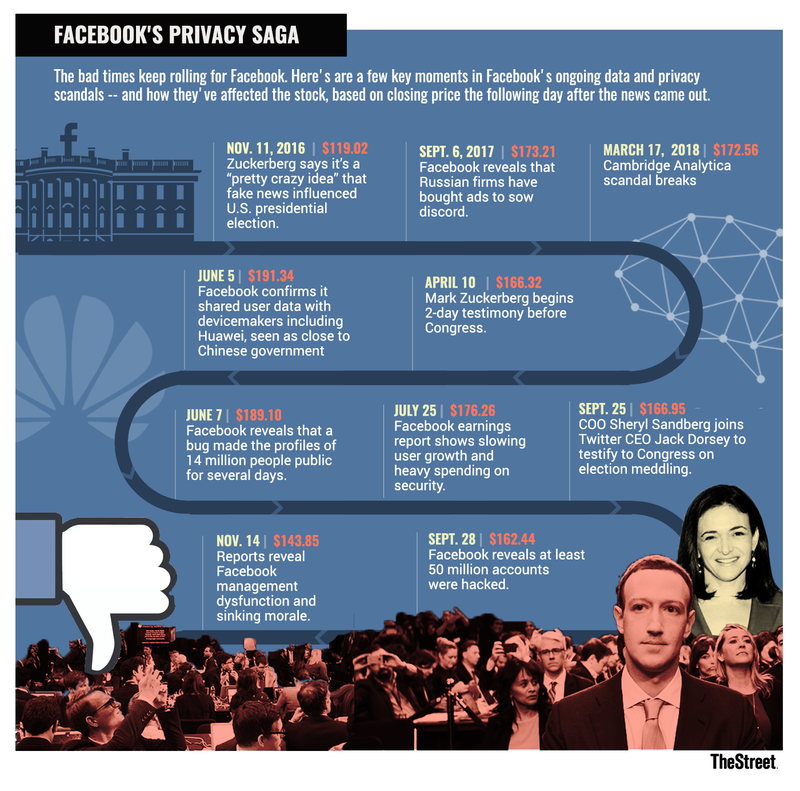 Facebook ended its relationship with Definers and both Zuckerberg and Sandberg denied knowledge of the firm's activities. For Facebook investors -- who have seen shares tank 39% since a July earnings report revealed slower growth and heavier security spending -- the question is who could step in to fill an apparent leadership void in Facebook's boardroom. Sandberg has served as COO of Facebook since 2008 and attracted a reputation as an "adult in the room" figure ushering the social network into its mature years. Along with Zuckerberg, several early Facebook investors and others, she also sits on Facebook's nine-member board. Sonnenfeld suggested several executives with the technology or media chops to step in on Facebook's board, such as Anne Mulcahy, former CEO and chairperson at Xerox (XRX - Get Report) , former Boeing (BA - Get Report) CEO Jim McNerney or former Ford (F - Get Report) CEO Mark Fields. He named recently retired PepsiCO (PEP - Get Report) CEO Indra Nooyi as the best candidate to step in as chairperson of Facebook's board. "She's smarter than anybody on the board, and the whole board combined does not have the global regulatory and tech savvy that she has," Sonnenfeld added. "She could transform the place." A strong grasp of global regulatory matters could come in especially handy at Facebook as it faces growing anger at the firm's misdeeds and potentially stricter oversight of its practices, both inside and outside of the U.S.
On Wednesday morning, shares of Facebook were trading up 2% to $134.94.